Last edited by markwoodlief; 12-06-2017 at 05:03 PM. Very Nice bike! Good to here they are starting off on the right foot with the new model. There seems to be a rush on Beta's around here lately. I'm on a Sherco and have ridden a few Beta's and don't see the what all the hoopla is about with that brand. Nice views too btw! Nice bike! Thanks for sharing the info! How are the engine vibrations? I've never rode a 300 so I've only read about some 300's vibrating a lot. My 200 doesn't vibrate much. I noticed a few vibes in the first hour or so of use. But now after about 50 miles of single track I don't feel it at all anymore. Initially only really felt in the footpegs. They quickly went away. Bike is super smooth. Although I need to get this suspension figured quickly. 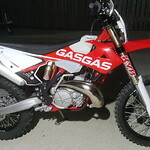 Going to ride the Beta tomorrow until I can some springs for the gasgas. Les Tinius (LT-Racing) is a very good suspension tuner that is in your neck of the woods (Port Orchard, WA) - he is well known in the gasgas/beta/husky communities. need heavier springs front and rear.. got a line on those? Mark get that bike all dialed in and then we will go on a ride to deburr it properly.